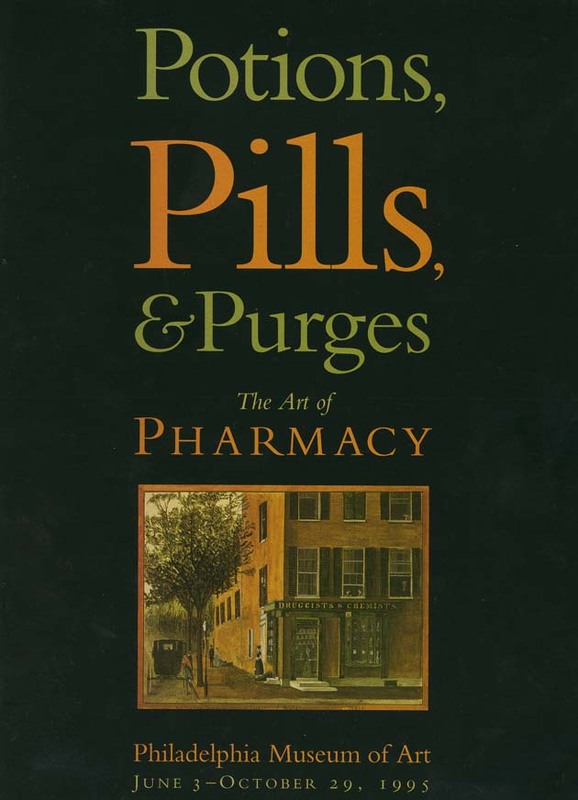 Information about the “Potions, Pills, & Purges” Exhibition at the Philadelphia Museum of Art. In contrast to many of their colleagues in the health professions, pharmacists are tied to the place of their practice. Physicians and nurses exercise their expertise in offices, hospitals, and patients’ homes, and dentists have been known, in the past, to operate in the open air. But the pharmacist depends on the ingredients, often bulky, that go into the prescriptions dispensed, and thus premises become necessary, whether in hospitals or in shops. The prints, drawings, and posters in this exhibition show this clearly. Other than the occasional French print where the pharmacist displays his alarmingly large clyster, or enema syringe, ready to be used in the home of a patient, representations of pharmacists normally locate them inside of immediately outside the pharmacy itself. Despite this limitation, however, the images of the profession that artists have been producing since the fifteenth century show considerable variety, ranging from reverential portraits to satirical barbds. Although there have been a number of exhibitions on medical themes in recent years, few have been devoted to the narrow focus represented in this exhibition. The Ars Medica Collection of the Philadelphia Museum of Art, with its extensive holdings, provides an incomparable resource to consider individual specialties in the health professions as well as specific procedures or diseases. Stimulated by an initial grant in 1949 from Smith, Kline & French, then a Philadelphia pharmaceutical firm and now the international company SmithKline Beecham, and supported by additional grants and gifts from commercial firms and private donors, the Ars Medica Collection has grown to encompass more than twenty-five hundred prints, drawings, photographs, posters, and graphic ephemera on medical subjects. These range from woodcuts and engravings dating from the Renaissance to contemporary collages and photographs. 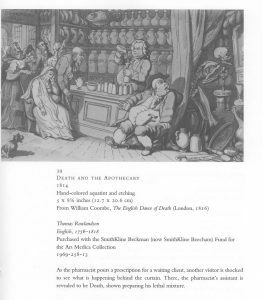 Not surprisingly, many of these images concern the practice of pharmacy and the manufacture of medicines, and it is from these that this exhibition has been drawn. In addition to its extensive history as a center for medical education and pharmaceutical manufacturing, Philadelphia has still another milestone to celebrate in 1996. The Philadelphia College of Pharmacy and Science began offering courses in pharmacy in 1821, and next year will celebrate its 175th anniversary, making it the oldest continuously operating educational institution of its type in the world. This exhibition commemorates this historic occasion.